There is good management and the place was clean. There wasn't a clock on the wall;that gave the place a sense of timelessness.There weren't any smells coming out of the kitchen, but the music from the ceiling flowed. It was a quiet day, which gave the place a sense of isolation, coupled by the fact that we were the only people in the restaurant on a Saturday afternoon. The location was first one of the only shopping centers on Darnestown road and now faces competition from the Falls Grove Shopping Mall and the Adjacent Traville Gateway. Have you tried El Mariachi in Rockville? It is over by the IHOP. 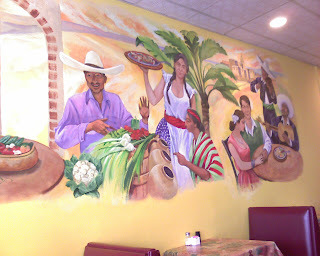 It's my favorite Mexican place here--although I haven't tried El Mexicano yet. I'll have to give that one a shot also. Great Suggestion. I will give it a try soon.